To be mindful is to be in a state of open, nonjudgmental awareness of whatever is happening in the present moment. 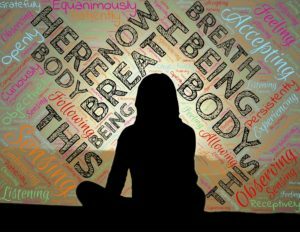 With its roots in Buddhism and popularized in the Western world by John Kabat-Zinn and others, mindfulness has been used to support clients in a variety of contexts as they work toward improving their mental and physical health. To cultivate the skill of present moment awareness, clients can practice specific exercises. Examples of exercises include noticing the breath, paying attention to body sensations or thoughts as they occur, and completing everyday tasks in a mindful way (e.g., mindful walking, mindful eating, mindful gardening, etc.). These exercises provide an opportunity for individuals to become aware of thoughts and sensations as they arise without necessarily trying to change or avoid them, and create spaces in their daily life for self-care and self-reflection. Transgender and gender nonconforming (TGNC) clients may find it helpful to develop a daily mindfulness practice. Because many TGNC people in the U.S. experience barriers to accessing care, including discrimination at a variety of institutional and social levels, it is critical to create opportunities for developing mindfulness that take into account the needs of these clients. Based on the results of several recent research studies (Stockwell, Popovich, & Gamba, 2017), here are a few recommendations of ways to make mindfulness exercises accessible to TGNC people, and these points can certainly be applied to work with other clients as well. Starting with brief periods of time, even two or five minutes, can offer a low-pressure way to begin to develop a mindfulness practice. Spending time observing one’s thoughts, sensations, or emotions can be a very unusual way to relate to these types of experiences, especially if they are uncomfortable or painful. When it comes to mindfulness, trying to do too much too soon can be overwhelming for many clients. Mindfulness practice should be life-enhancing and help clients move toward their values – in short, it should have workability for the client. If clients want to continue with mindfulness exercises, encourage them to focus on whether it impacts their life in a positive way and helps them move in valued directions, rather than basing their practice on an idea of what “good” mindfulness is supposed to look like. Although there is evidence that longer durations of mindfulness and meditation practices may be necessary in some situations to achieve certain positive outcomes, it is important to support clients in noticing the momentary impact of mindfulness practice on their behavior and overall wellness, so that they can remain sensitive to what is happening for them in particular, rather than striving for an ideal. Related to this point, mindfulness exercises should be presented with the idea that clients can quickly opt out or take breaks whenever they choose based on what they are experiencing. Therapists who affirm a client’s withdrawal from an exercise promote trust and allow the client to move at their own pace. For many TGNC clients, family and childhood related topics can be challenging to focus on. Because of this, it may make sense to avoid, for example, asking a client to select an immediate family member to send well wishes to during a Lovingkindness exercise, or to picture themselves as a young child. Instead, exercises can be phrased in more general ways such as asking them to select a person they’re close to or picture themselves at an earlier time in life that they feel comfortable thinking about. Exercises that involve noticing sensations in the body can be less distressing and more helpful if clients can focus on areas of the body that are low in emotional intensity. For example, rather than focusing on the chest, ask the client to focus on sensations in the feet or elbows, or to pick a body part they feel comfortable focusing on, with the option to change their focus to another body part whenever they choose to. 3) Mindfulness practice doesn’t have to look like just one thing! Although one common posture for practicing mindfulness is to sit cross-legged on the ground, this is not comfortable, or even possible, for all people. Rather than setting the expectation that there is one position or posture for practicing mindfulness, clients can be encouraged to try out different physical positions, including sitting in a chair, laying down, walking, etc. For clients who don’t feel comfortable closing their eyes during an exercise, it’s completely fine for them to keep their eyes open and focus on the ground in front of them. For clients who experience anxiety with silence, exercises with ongoing narration and fewer periods of silence can help. Additionally, although some clients may find it meaningful to use visualization and imagery as part of their practice, this may be difficult or impossible for other clients to accomplish; because of this, exercises should include instructions offering a client an alternate option to visualization. For example, during the Leaves on a Stream exercise, which asks a person to notice each thought that comes up, “put it on a leaf,” and then visualize the leaf as it floats down a river, a client can also be given the option to just notice each thought as it occurs, and say to themself, “thinking, thinking,” if that is helpful to maintain attention. Finally, there are many ways that the physical environment can be arranged to make mindfulness exercises accessible through a lens of neurodiversity; this can look like asking a client about what level of lighting works best for them, and if they are interested in using a blanket, fan or stim toys during the exercise. Fawna Stockwell is the Director of Research and Programs at Upswing Advocates, a Chicago nonprofit organization that provides sliding scale coaching, groups, trainings, and research opportunities that focus on the LGBTQIA community. Fawna is also the Associate Director of Research in the Applied Behavior Analysis department at The Chicago School of Professional Psychology’s Chicago campus.